One of a series of marine-themed necklaces, the hot colours of coral and agate, set against silver, bring to mind glimpses of tropical underwater scenes, brimming with brilliant anemones and glimmering fish. The second in a series of necklaces with a distinctly marine flavor, the intricate agate pendant is framed by silvery seahorses and a rich tapestry of carnelian oranges, coral reds, pearl, agate, and dichroic glass. 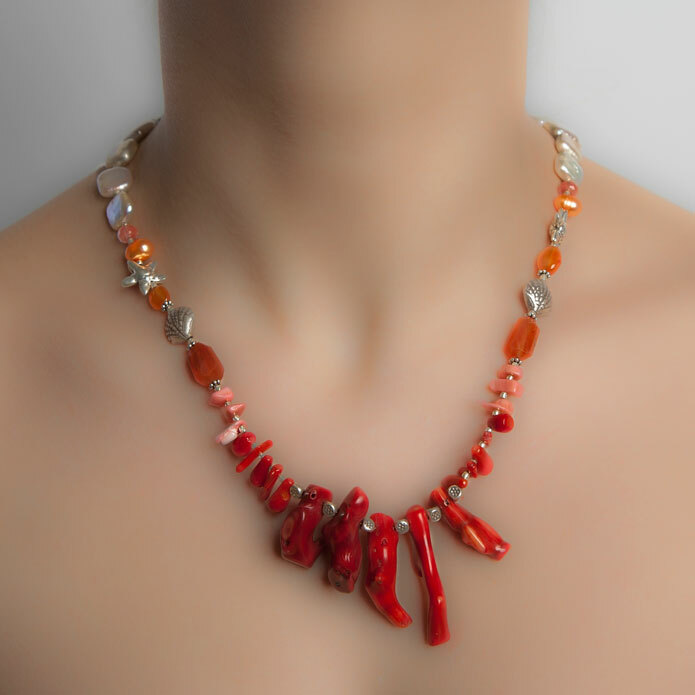 This piece is deceptively simple, its asymmetry bringing a modern twist to ancient and precious materials; silver, coral, carnelian and pearl lend the necklace an air of sun-lit waters and the brilliant ruby hues of tropical marine life.